Our ASA resin 4x6 fence post caps are only available in the nominal size. They come in one style - the pyramid estate series. These hard plastic 4x6 post caps are made of the same material that automobile and marine vehicle manufacturers use. It’s superior to wood, will outlast wood, and won’t require any maintenance. Our 4x6 fence post caps bear the Atlanta Post Caps label, and they’re made in the United States. These 4x6 plastic fence post caps will fit wood posts that measure between 3,5” x 5.5” and 3.75” and 5.75”. Purchases of ASA resin post caps come with a 10-year guarantee against discoloration, fading, and warping. Our ASA resin plastic post caps, including the 4x6 fence post caps, are the only patented deck post caps on the market. Our SNAP-CAP installation system takes all the guesswork out of the installation. They’re easy to install in no time. ASA resin is stronger and longer lasting than any wood post caps on the market. 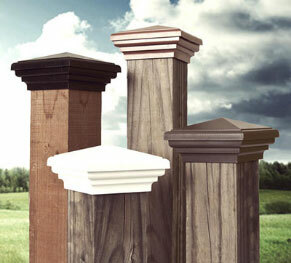 Our dual purpose deck post caps will protect your wood posts and enhance the beauty of your landscape. The 4x6 post caps come in black, brown, cedar, olive green, and white.